Joan Frances Turner was born in Rhode Island and grew up in the Calumet Region of northwest Indiana. You can see trailers and read excerpts of Dust at the Dust website. CLICK HERE FOR MORE TITLES BY JOAN FRANCES TURNER. Sometimes, when I give a book a middling rating, it means the book was middling throughout. This is not one of those times. 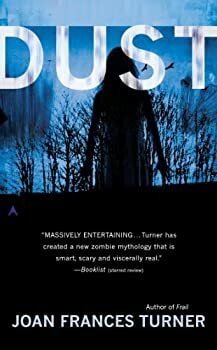 I intensely disliked the first half of Dust, and it took me about a month to get through it. The second half, I loved, and read in one day. a light shining from a farmhouse window on some dark, empty highway, streaking brightly across your windshield as you drive past, and then fading. And then gone.